Convenience Store Woman – loudlatinlaughing – Euge! Euge! 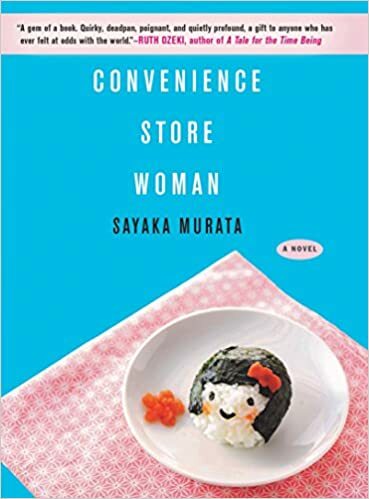 Sayaka Murata’s story (translated from Japanese by Ginny Tapley Takemori) about a weirdo woman who just can’t fit in with society. She knows from an early age she’s not quite right, clanging one kid over the head with a shovel to stop a fight, gleefully bringing a dead bird to her mom and saying they should cook it for dad’s dinner. She struggles through school then ends up taking a wrong turn and spotting a convenience store that’s about to open in a business district. By the next week, she’s all trained up and ready to help them open. The employee manual is the first time anyone has given her explicit instructions on how she’s supposed to behave, what to say, what facial expressions to make, and she loves it, she fits in. Eighteen years later, she’s still there, working diligently and absorbing speech patterns and fashion tips from her coworkers. Her so-called friends worry about her having a dead end job and no husband, so she asks the guy who just got fired from the store if he wants to get married. He moves in and hides from the world and from his debt, sponging off her meager salary and encouraging her to find a different job that pays more, to take care of him. He flips through the help wanted ads, happy to peruse them as long as the job isn’t for him. On the day of her interview, she wanders back into a convenience store and realizes that’s where she belongs, so dumps him and dives back into her life.